Opulent Treasures has been fortunate enough to be in a partnership with HomeGoods since 2001. Our treasures have been sold at HomeGoods for over 17 years! Look for the Opulent Treasures Heart Hang Tag! Each piece is stamped for authenticity! 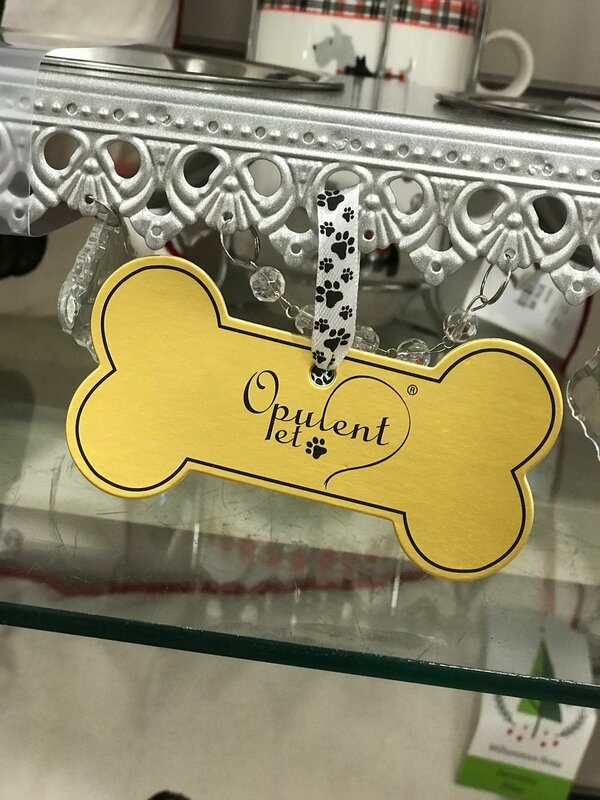 We are SOOOO excited to announce the launch of our NEW luxury brand for your pampered pets… Opulent Pet® !! You will only find these in HomeGoods, T.J. Maxx & Marshalls and just in time for holiday shopping! Love our Logo Hang Tag! Our trademarked brand of entertaining pieces work together as a charming collection as well as décor that adds elegance to any home. Many pieces showcase cakes, cupcakes and desserts to make a gorgeous impression. Many styles are stunning centerpieces that can also present candles and floral arrangements for your celebration. Designs are multifunctional and versatile. Perfume bottles, cosmetics and jewelry make creative displays. Cake plates can be stacked to add height and space to your table. Chandelier glass crystal accents add charm and opulence to any occasion or décor. Sturdy metal construction shows hand brushed antique finishes beautifully. 31" H / Tiers-12" 10" 8"
Find a HomeGoods store near you … here! 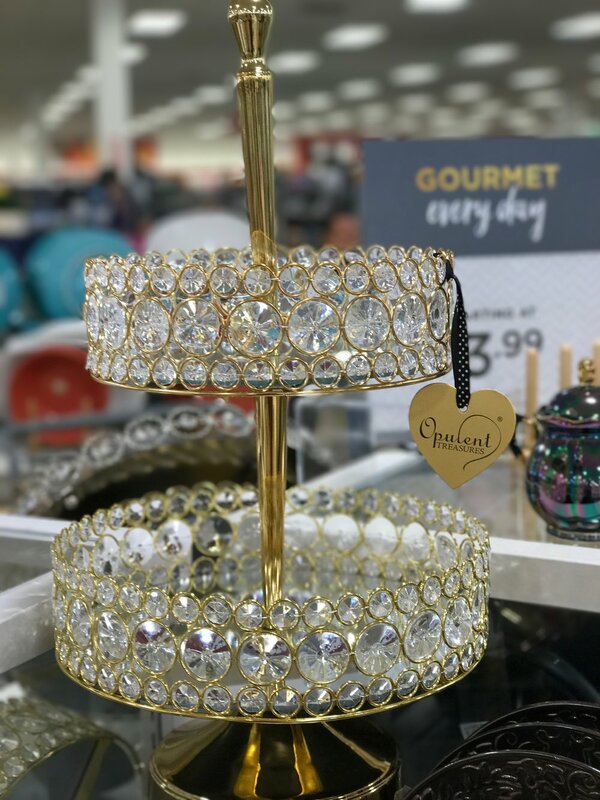 Buy Original Buy Authentic from the Creators of the Chandelier Cake Stands! We are ONLY sold under the Opulent Treasures Brand Name and our pieces have the Opulent Treasures Heart Hang Tag! Each piece is stamped for authenticity! All of our designs are Made To Treasure! 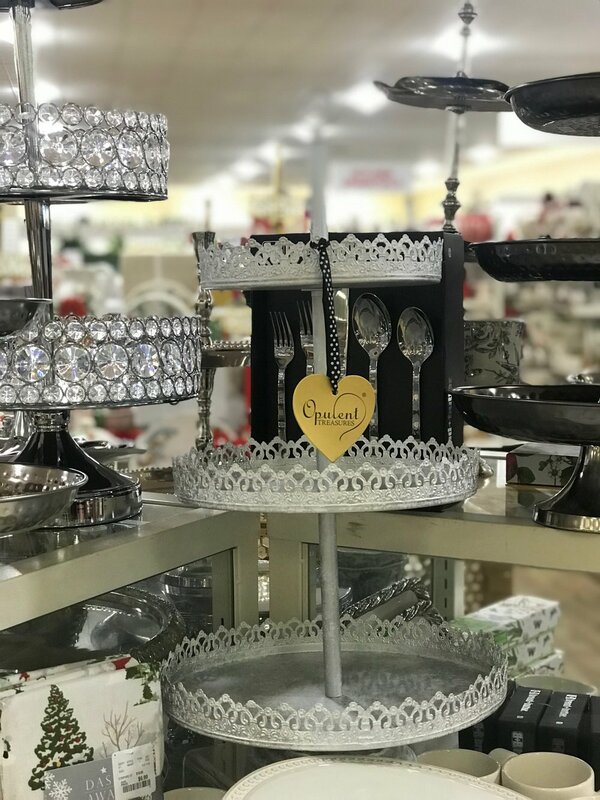 Get ready for holiday entertaining with Opulent Treasures collection of entertaining pieces and home decor found at HomeGoods! 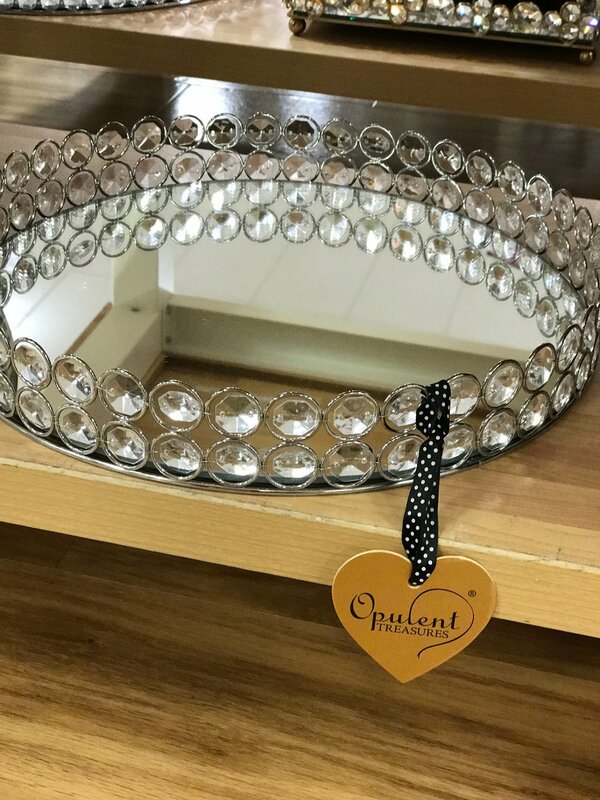 Opulent Treasures unique collection of entertaining and home decor pieces make fabulous gifts for the holidays! Tiered trays can be used for desserts but also make gorgeous jewelry and perfume displays. Rose gold has become the metallic color of the year, gracing everything from our phones to makeup and even hair. We LOVE our shiny rose gold finish on our Baroque Pedestal Base Cake Stand … we also offer a shiny silver and shiny gold finish in addition to our classic antique gold, antique silver, white and black cake stands! Shop the collection by clicking here! Opulent Treasures HomeGoods Haul!! Make sure to tag #opulenttreasures #gofinding with your treasures! !